This is music as would be heard by in-universe characters. For example, while everyone the Klingon Theme (called “Klingon Battle” in the score cue) from Star Trek: The Motion Picture with Klingons, it’s not necessarily music that in universe Klingons would recognize as part of their musical world or culture. One of the things that strikes me as odd–and this is as much a commentary on contemporary culture and how these forms of media seem to reflect it–is that there tends to be very little diegetic music being written (with a few exceptions) in many of these franchises. Why I find that odd is that it says something about how writers view the role of music in the lives of the people inhabiting their worlds. I’m going to talk a little about television rather than film and video games since there are quite a few relatively popular sci-fi themed series currently airing. Post-apocalyptic series seem to be pretty popular these days. The Walking Dead, Falling Skies, Revolution, Defiance are currently airing series while some recent cancelled series like Terra Nova and Primeval: New World had an implicit post-apocalyptic future world as a backdrop to the modern or past settings (it should be noted that both the latter heavily involved time-travel and regularly featured dinosaurs–things that didn’t seem to help the rebooted V series or The Sarah Connor Chronicles). 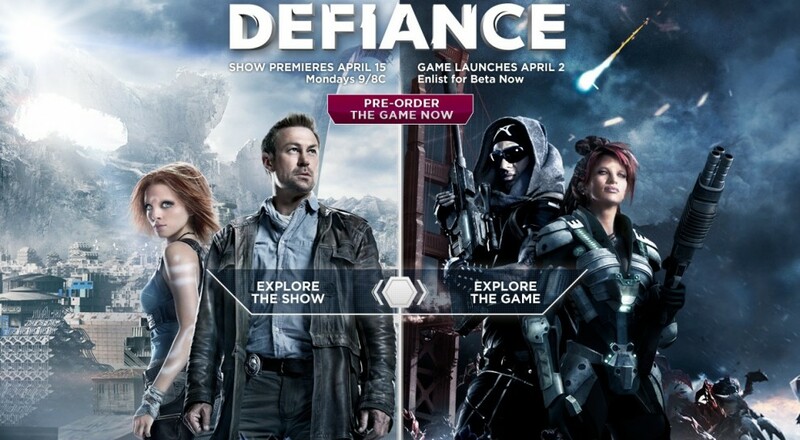 With the exception of Defiance (notable for being launched as a video game and television series), there is next to no diegetic music portrayed within the series respective worlds. It can be argued that in most of these series the inhabitants are spending too much time just trying to survive to worry much about, say, listening to music much less making it. But I just can’t shake how full of song and music that, say, Tolkien’s Middle Earth is (some of which he started writing while he was in the trenches during WWI). Is it fair comparing fantasy to sci-fi? Well, how much diegetic music is in the popular Game of Thrones? Or the recently ended Merlin series? Or recently cancelled Sinbad show? The interesting thing about Bear McCreary and his work for Defiance is that he has to create specific musics for the various Votan races as well as creating the score for the episodes–in other words he is writing both in-universe and out-universe music and his blog about some of that creation process is fascinating and familiar (as I had to do similar in/out universe music for the Klingon Christmas Carol). This brings us back to the Klingons at the beginning of the post–the Star Trek universe had copious amounts of diegetic music. Klingon Opera became as ubiquitous a topic of conversation amongst characters and we have characters listening to or singing it as well as numerous other styles of Klingon music. It’s not as if I’d want characters to spontaneously break out into song as in musicals (though interesting to note that musical movies have pretty much died out–Les Misérables film notwithstanding) but cultures seem more alive and 3-dimensional with active music participation. Alien music (I guess the Klingon stuff falls into this category) is a bit easier to manage since it’s alien and hell, you can throw together a glob of cacophony quickly that sounds damned weird and just call it “alien.” But the only instances of in-universe music I can think of in the Trek series involved either actors who could play the things (Frakes) or music that was safely in public domain. I’ve discovered that there is a large pool of musicians who have agents and talent companies that hire them out for tv and movie appearances. One of the reasons I started growing the beard/hair out is because I saw a call for long-haired, bearded cellists for filming in season 3 of Game of Thrones back in October of last year. I realized even if I had the time to to go to Northern Ireland to film I didn’t have an appropriate headshot as it had been years since I’d had long hair and/or a full beard. In universe music is an interestingly complex phenomena. In some cases, such as with Bear McCreary–he writes and often records (or hires the artists to record) the in Universe musical selections. The lyrics are usually written by someone else and then translated into Castithan or Irathient by David J. Peterson, the creator of the languages (also the creator of the Navi language for James Cameron’s “Avatar” movie). In the Star Trek series, many of the in Universe Klingon numbers were written by producers (and whoever they hired to do the actual music writing and lyrics translation) rather than the score composer. The producer of Alien Nation, Kenneth Johnson, actually created the Tenctonese language for the series which is used in some of the actual songs heard in various scores for the episodes. Not being a linguist, his creation amounted to English words spelled backwards with a smattering of Russian and anagrams of his wife and daughter’s names. If I remember correctly the title song for the series specifically uses those family anagrams for the lyrics. I know I’d love to learn more about it — I didn’t realize it was as involved a thing as it evidently is!